Namas Solutions is a Web Design and Development company based in New Orleans, Louisiana. Since 2011, we have partnered with small businesses with one simple goal: to give your business a professional web presence. We know making decisions can be difficult. We’re a small business, too. We understand the never-ending “to-do” list. So let us check “custom-built website” off your list. And to let you focus on running your business, we are committed to making the process as easy as possible. Simply put, we get your business online. We take the headache out of getting your company’s website up and running. We are committed to making the process as pleasant and efficient as possible. We build websites that are aesthetically pleasing, standards-compliant, mobile device-friendly, and most importantly, we build websites that bring your business results. And at the end of the day, you will have a professional, custom website for an affordable price. I have never been happier to give such a great company an outstanding review! Madhav is an absolute delight to work with. 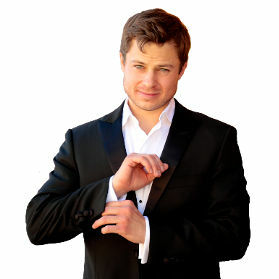 He is helpful, and considerate and his work speaks for itself. I would recommend Madhav and Namas Solutions to anyone and everyone. I trust him for all my website needs! Overall my experience was very positive. I would and have recommended Namas Solutions. I was very pleased with the website that you produced. The design and functionality was greater than I ever expected. The site was completed on time and within the budget quoted, which was the most important to me. Will work with you again soon! The experience could not have been better: creative ideas and prompt service.....it's great to work with a company that actually listens to us and cares about our needs! Madhav is the man who actually makes it all happen for us, and we are grateful for not only his outstanding web design and excellent internet advice (he really understands how to get down to what is most important!) but also his friendship. The American Culinary Federation: New Orleans Chapter is an organization of professional chefs striving to make a positive difference in the Hospitality and Tourism Industry within the Greater New Orleans region through service and to serve as a conduit of culinary education and professional development through apprenticeship, mentorship, scholarship and certification. 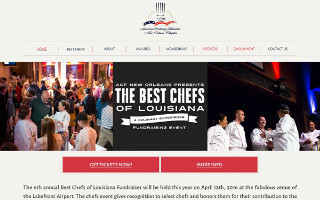 ACFNO called upon Namas Solutions to create for them an easy to edit website that would help attract new members as well as promote their annual events, such as Best Chefs of Louisiana, which benefits the New Orleans Mission. In addition to the website, we built a separate application that allowed members to submit their applications for Best Chefs online, traditionally a long process involving many pages of forms. Finally, we set-up an online voting platform for members to securely vote online for the Chef of the Year Award. ACFNO has many events coming up, including Best Chefs 2016. 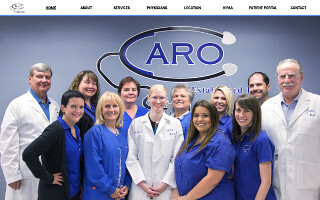 Caro Clinic is a medical clinic in Gonzalez, LA, just outside of Baton Rouge. They called upon Namas Solutions to transition their web presence to a clean, easy to use design for optimal user experience. The site showcases Caro Clinic's services, general info, and information on individual practicioners. 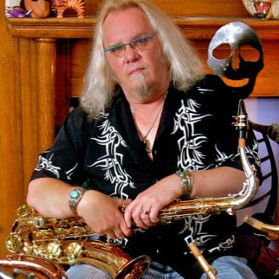 Dr. Richard Caro was recently honored by the city of Gonzales for he and the clinic's numerous contributions to the Gonzalez community over the years, and their commitment to the city continues. Services: Website Design, Custom WordPress Theme Development. 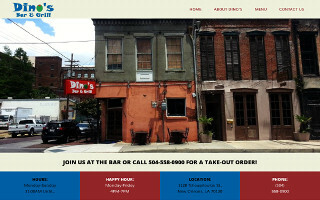 Dino's Bar & Grill in New Orleans needed a website to supplement other advertising campaigns to attract more customers. We built a one-page website with all pertinent restaurant information easily accessible. Dino's has become very popular with convention visitors due to its great food and its proximity to the Morial Convention Center. Our favorite are the Dino's burgers! 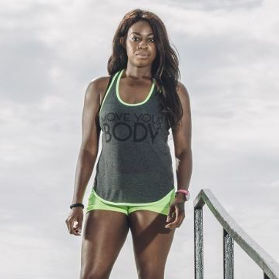 Ify Obiako is a fitness trainer who strives to help people who are serious about getting fit but feel a little stuck. She called upon Namas Solutions to build her a website that showcases her services as well as her free e-book, The Beginner's Guide to Clean Eating. 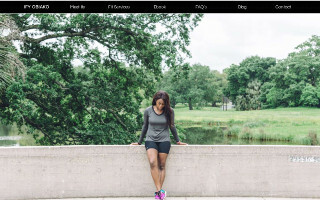 We built her a site that uses the MailChimp newsletter service to update subscribers of new ideas and concepts in fitness, as well as updates regarding new e-books. We built her website, set-up her corporate e-mail, and integrated MailChimp with her website. Ify's currently working hard to help people acheive their health and fitness goals. 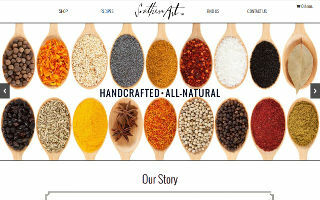 Hanley’s foods approached us in the fall of 2013 to convert their static website to a full-fledged WordPress-based site. In addition to converting all current pages into dynamic WordPress pages, the folks at Hanley’s wanted to add a store locator as well as a “Recipes” section, where they showcased recipes made using Hanley’s products as well as took recipe submissions from users. We worked with Hanley’s owner Richard Hanley, a professional graphic designer and ex-creative director to fully recreate the Hanley’s site while retaining the integrity of Richard’s original design. 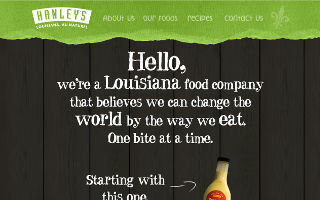 Hanley’s Foods are currently being distributed throughout the Gulf South and can be purchased online at hanleysfoods.com. Jordan & Alexis Ruiz got in touch with us in November of 2011 to create a website for their new restaurant, The Munch Factory. After getting a good feel for the restaurant, we got to work building a website that matched the look and feel of the restaurant itself. We used a number of high-resolution background photos to give website visitors a bit of a taste of what to expect on their visit to the restaurant. We’re happy to say that The Munch Factory has only been getting bigger and better since we first worked together! Kelly Woo, owner of Southern Art Co., a gourmet brand of hot sauces and dressings, called upon us to build her a WordPress-based e-commerce site. We worked with Kelly to come up with a basic design for the site, then we built it within WordPress, and included an online store developed on the WooCommerce framework. With rising online and retail sales, Southern Art Co.’s products will soon be seen in shops throughout the South as well as the Northeast. 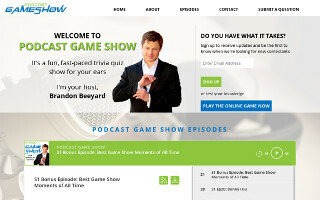 We met PGS host Brandon Beeyard at a WordPress meetup and when he was ready to launch his new game show podcast, he called us to help build a site where people could listen to episodes, learn more about the podcast, submit questions to ask contestants, and test their knowledge by taking a quiz. The podcast has taken off, and season 2 of the podcast is currently being recorded. ©2019 Namas Solutions LLC. This website was proudly built with Open Source Software.